A satirical look at the rampant power of movie stars and the diminished emphasis on artistic creativity and directors with vision, Simone (also known as S1m0ne) is engaging without ever rising above its basic premise. 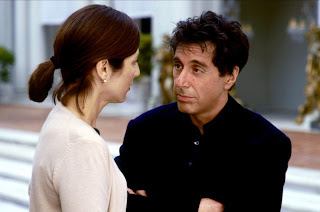 The latest project of film director Viktor Taransky (Al Pacino) is falling apart: his leading lady Nicola Anders (Winona Ryder) throws a fit and quits the movie prior to completion. For his failed efforts, Taransky is fired by studio head Elaine Christian (Catherine Keener), who also happens to be his ex-wife. Hank (Elias Koteas), a trenchcoated creepy tech geek about to lose a battle with cancer, provides Taransky with sophisticated software that can create a lifelike virtual movie star. Taransky puts it to use, creates an alluring actress that he calls Simone (Rachel Roberts), a short form of Simulation One, and inserts her into his film in place of Nicola. No one notices that Simone is not real; the film is a huge success, and Simone becomes the newest movie superstar, albeit a rarely seen one. Taransky's reputation is restored and he proceeds to place Simone in several movies, her popularity growing to international levels despite her rare public appearances, always remotely and tightly controlled and manipulated from behind the screen and keyboard by Taransky. Elaine rediscovers a sudden romantic interest in her ex-husband, and develops an insane jealously of the non-existent Simone. Eventually all the lies make Taransky's life as miserable as dealing with the likes of Nicola, but he finds that extinguishing Simone's career is much more complex than he could have imagined. Although technologically Simone was quickly surpassed with the rapid evolution of sophisticated animation in real movies, its two messages do continue to resonate: fantasy may be easier to deal with than reality, and beware the most idealistic dream: it may just become real. Taransky's initial intolerance of diva behaviour is understandable, and his virtual creation appears to satisfy all his wishes: Simone is perfectly compliant, and says only what is on Taransky's mind. Fantasy has its immediate attractions, and as much as director and writer Andy Niccol is applying this concept to dealing with stars carrying overinflated egos, the same is true for society as a whole, most notably in the escapism provided by the movies themselves as well the world of hide-behind-the-screen digital entertainment. Also true is the power of creations to take over the world of their creators. In a story as old as (Victor) Frankenstein's monster, Simone eventually dominates Viktor Taransky's life to an extent that no self-obsessed human actress could have managed. It proves easier to unleash the fantasy than control its impact, and the virtual Simone creates overwhelmingly real trouble for Taransky. Al Pacino does not need to stretch to bring Taranski to life, filled with faux victimization and grandiose ideals of his artistic merits. Simone carries a biting undertone of self-directed satire: Viktor is as insufferable as the stars that he complains about. Evan Rachel Wood as his daughter does well to ride the line between pleasantly precocious and annoyingly perfect, while Winona Ryder gets just two scenes, but is captivating in both. The rest of the supporting cast is relatively bland, Catherine Keener's studio executive sticking close to stereotype and Rachel Roberts understandably remaining mostly a pretty face with a pixilated smile. Simone entertains and poses interesting questions about the impact of virtual reality, but does not necessarily always find the most interesting of real-world answers.